It was quite spontaneous, this picture. My brother was working at a Sam’s Club somewhere near Dallas, and his co-workers were having a Christmas Party/Talent Show. My brother played his base guitar that evening on the make-shift stage where we also heard songs sung, instruments played and a display of other gifts people had been quietly working on at home. There are little stages like this that spring up in unexpected places, a little sacred space where we observe what others have done with their gifts, where we dare to share the things we’re compelled to do, the art we can’t help making. And this particular evening, the sacred stage was a space beside the closed-out cash registers, in front a few rows of folding chairs, by a table overflowing with food made with ingredients from Sam’s Club. I wandered around the space, as I do, observing the humans in their natural habitat when something wonderful happened. I wanted to be first in line, but I knew I had to wait for the young children to go first. I was, after all, 19 now and not his intended customer. But he didn’t seem to mind me perching on his knee after handing off my camera to the person who was taking the pictures. Before the next person had a chance to pose with Santa, I hopped up, grabbed the camera and made my proposal. 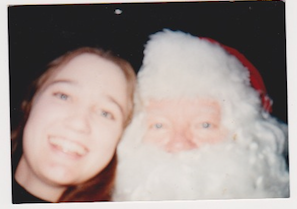 And Saint Nick was very jolly indeed to pose for what would come to be known as a late-20th-century selfie.